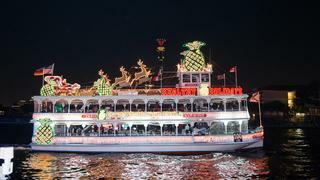 The Winterfest Boat Parade is held in Fort Lauderdale, Florida, each December. Welcoming a fleet of yachts decorated for the festive season, the parade of boats works its way through 12 miles of waterways. 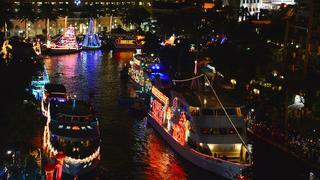 The Winterfest Boat Parade in Florida is celebrating its 44th year. Over those four decades, this festive event has become one of the biggest one-day spectator events in the United States. 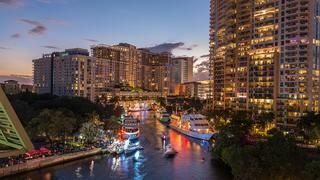 Over 100 yachts participate in the Winterfest Boat Parade each year. 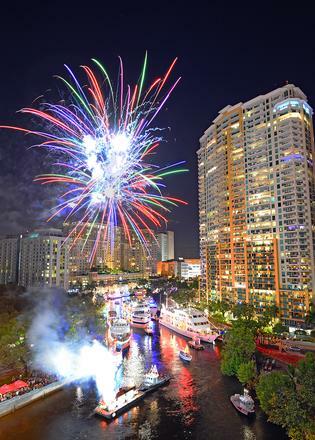 This photo, from the 2014 parade, shows the mix of yachts that are welcomed to Fort Lauderdale's waterways each December. 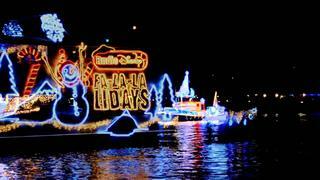 Winterfest Boat Parade is one of the top 20 parades in the world, according to the official website. It claims there are over one million spectators and millions of people watch it as the event is broadcast. 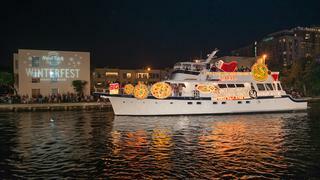 Each Winterfest Boat Parade has a theme: last year's was 'TV's greatest hit'. 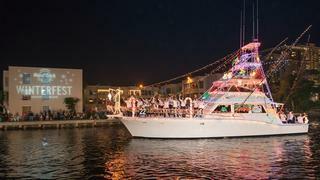 The 2015 event is themed 'fairy tales afloat'. Other notable themes from previous years include 'rocking boats and holiday floats' (2011), 'pirates in paradise' (2002) and the challenging 'love in any language' (1988). 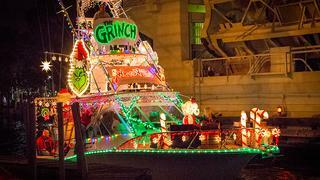 Each Winterfest Boat Parade has a theme: last year's was 'TV's greatest hit'. The 2015 event is themed 'fairy tales afloat'. Other notable themes from previous years include 'rocking boats and holiday floats' (2011), 'pirates in paradise' (2002) and the challenging 'love in any language' (1988). Organisers of the Winterfest Boat Parade pride themselves on this multicultural event that's open to all – even Christmas Grinches. This picture is from the 2013 parade, themed 'passport to paradise' to celebrate the diverse appeal of Winterfest Boat Parade. When Winterfest Boat Parade kicks off this month, rapper, actor, comedian and television host Nick Cannon will be the Seminole Indian Hard Rock Winterfest Parade Grand Marshall. His predecessor was local rapper Flo Rida. 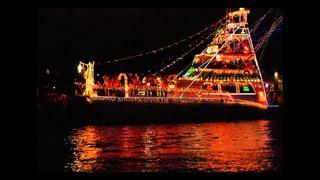 The 2015 Winterfest Boat Parade is on Saturday December 12. Applications are now closed, but spectators are encouraged to line the 12 mile course to cheer on the festive yachts as they pass.